The title of this exhibition—“MAN RAY: CONTINUED and NOTICED”—is a direct response to the title Man Ray gave to his show at the Copley Galleries in Beverly Hills, California, in 1948, which he called “To Be Continued Unnoticed.” Man Ray must have wanted these words to let his audience know that he was still working (“continued”), but that he worked with virtually no recognition (“unnoticed”). 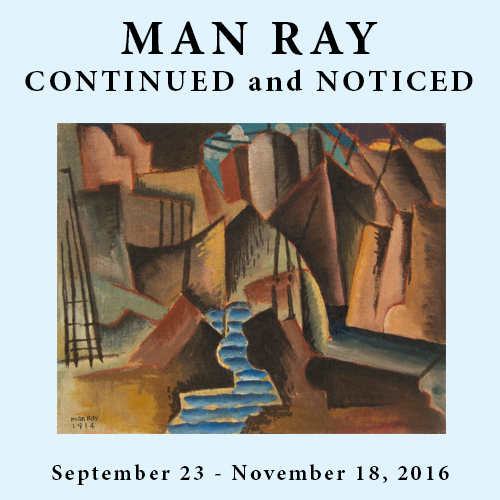 The present exhibition—held 68 years after his show at the Copley Galleries—is intended to demonstrate that Man Ray’s work not only continues to be of interest, but that it is still noticed and, with the passage of time, better understood and appreciated (although the latter may never have been his intent). Moreover, it is hoped that Man Ray will no longer be viewed exclusively as a photographer (a goal he clearly shared), but as the protean, multi-media and multi-disciplinary artist that he was. He was a highly skilled draftsman, a painter, object-maker, photographer, filmmaker and author. By the time he moved to California in 1940, he had spent some 20 years working in Paris as a professional photographer and, in the process, became internationally known for his talents behind the camera and for his experiments in the darkroom (especially for his inventive use of new techniques: the rayograph and solarization). At this point in his life (when his show was held at the Copley Galleries he was 58 years old), Man Ray realized that his reputation as a photographer had overshadowed his creative output in all other media, a misconception that he made every effort to correct. Above all, he wanted people to understand that he was a thinker who employed whatever means were necessary to best express an idea, whether that be through drawing, painting, combining objects, or, in select circumstances, even photography. 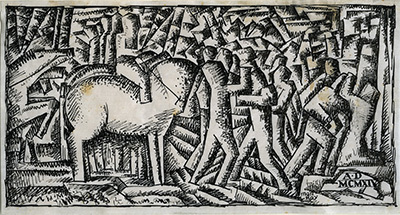 It was for this reason that Man Ray included earlier paintings in his Copley Galleries show, from a sketch made for a mural in 1912 (now lost), to works produced in New York and Ridgefield in the years immediately preceding his move to Paris in 1921, a formative phase in his career that, in retrospect, he realized was crucial to an understanding of his subsequent development as an artist. Although it is improbable that Man Ray was aware of it himself at the time, five basic concerns emerge in his work in the earliest phases of its development in Ridgefield and New York, elements that would be retained in one form or another in almost everything he produced later in his career: (1) a defiance of artistic convention replaced by steadfast commitment to absolute freedom in the arts, an attitude reinforced by his association with the anarchist movement in New York; (2) an acknowledgment and respect for the formal properties in works of art, which he believed that, if properly employed, could serve to unify the arts; (3) a realization that the idea for a given work of art took precedence over the form that was used to express it, a conceptual approach to making art that he likely gleaned though his friendship with Marcel Duchamp and his knowledge of the Dada movement in Europe; (4) an awareness that experimentation and invention were the cornerstones of creativity, which meant that whatever medium he elected to use, it should be exploited to its full potential, even if that meant using it in a way that had never been done before; and (5) the conscious and intentional infusion of humor into art, a quality that is an indirect result of his irrepressible creativity and, once again, the influence of Dada. In seeking out entirely new ways in which to express himself, Man Ray came to realize that a touch of levity could dampen the seriousness with which art is customarily taken, making it more pleasurable to produce and more enjoyable to live with. Eventually, these tenets would come to permeate his entire approach to the art-making process, for although he would never produce anything with the idea of accommodating or satisfying the expectations of his public, it was almost always a work of art designed to defy convention, while at the same time remaining aesthetically pleasing and conceptually engaging.